Sept. 20, 2007 -- The Arkansas State University Theatre has announced the cast for the upcoming production of "Wait Until Dark" by Frederick Knott. 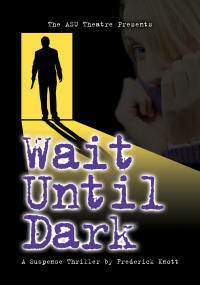 "Wait Until Dark" is an intense Broadway hit. This claustrophobic suspense thriller plays upon everyone's worst fear of being alone in the dark with a maniacal killer.The New York Post describes it as "... a first rate shocker...the suspense drama we've long awaited eagerly." The cast includes Aaron Beale, a sophomore theatre major from Sherwood, as Mike Talman; Donnie Walters, a junior theatre major from Trumann, as Sgt. Carlino; Jared Weston, a junior theatre major from Jonesboro, as Harry Roat Jr.; Heather Wells, a senior theatre major from Heber Springs, as Susy Hendrix; Brian Laveck, a senior theatre major from Olive Branch, Miss., as Sam Hendrix; Emma Watkins, a sixth grade student at The Visual and Performing Art School in Jonesboro, as Gloria; Ben Gibson, a junior theatre major from Jacksonville, as Policeman One; and Kwmane Gorins, a sophomore theatre major from Dermott, as Policeman Two. The ASU Theatre's production of "Wait Until Dark" is under the stage direction of Bob Simpson, department of theatre chair and professor of theatre. Jeff McLaughlin, assistant professor of theatre will direct the scenic and lighting design. Kelly Schaefer, assistant professor of theatre, will serve as costume designer. Stage management for the production is assigned to Amy Penny, a sophomore theatre major from Jonesboro. "Wait Until Dark" will show at the Fowler Center Friday and Saturday, Sept. 28-29, and Tuesday and Wednesday, Oct. 2-3, at 7:30 p.m. A "meet the company" dessert reception will follow the Sept. 28 opening night performance. Ticket prices are $10 the night of the production or $8 for advanced reservations. Tickets may be purchased for reserved seating in advance at the ASU Central Box Office in the Convocation Center or by calling 972-ASU1. Tickets are also available online at tickets.astate.edu. Children under six years old are not admitted to The ASU Theatre. Please arrive early as latecomers will not be seated until intermission.